A birthday cake is a special part of the happy birthday. Birthday cake ideas? There are some amazing shop bought creations available, but nothing beats a real home made birthday cake. It's always the home made cake that is remembered longest. Can you remember the last time some-one made you a birthday cake? < td> I've always wanted to learn how to make those cute cartoon figures to decorate my cakes. My Gran used to make the most amazing birthday cakes. 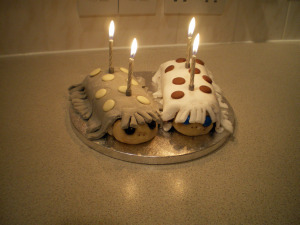 If fact my Gran's cakes were one of the most memorable things about my 'younger year' birthdays. Normally they were extremely rich, usually chocolate! Doesn't it feel really good to know that some-one's gone to the time and effort? There are 2 elements to making a great cake, the ability to make a basic recipe and some inspiration for the finished master piece. To make or not to make! Bake the cake several days before and decorate at the last minute. This should take some of the stress out of it. Ask a friend or relative if they could help out and bake it instead. Turn a store bought cake into a work of art. Buy a plain cake and decorate it your self, many supermarkets sell basic cakes in the bakery isle just for this purpose. Buy a cake from a local bakers, they will normally have a more 'home made' look, and you can usually have some input into the decorations. Buy a personalised cake topper, again from a local bakery or the web. How about a Chocolate Fountain With marshmallows and fruit. I'm not sure where the candles will go though! If you really can't face making a happy birthday cake, you can send some birthday cake clip art!! Double check you have everything you need, don't assume it's in the cupboard before you start! Buy or borrow an oven thermometer. Some ovens can vary hugely and it will affect the finished result. If you're adding fruit, dust it with flour first - it's less likely to sink! Make sure the rack is in the centre of the oven, and place the cake on the rack centre. this ensures it cooks evenly. Magic Relighting Candles , these are the one's that don't blow out, always raise a laugh! Musical candles - usually with the happy birthday tune, a great idea if you don't like singing happy birthday! 50th birthday cake ideas A One stop information shop for all things 50th birthday! Did that inspire you at all? I hope so! I'd be delighted if you could add some of your happy birthday cake ideas to my site, and if you could add a photo that would be wonderful too! 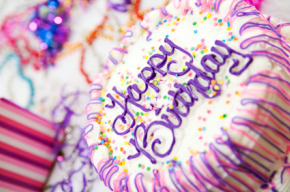 Have Great Birthday Cake Ideas to Share?